Cars produce a mighty din when they cross the bridge's large expansion joints, located over the hinges where the road decks on fixed columns meet the mobile transition spans. These spans swing up and down to match seasonal changes in the levels of Lake Washington. 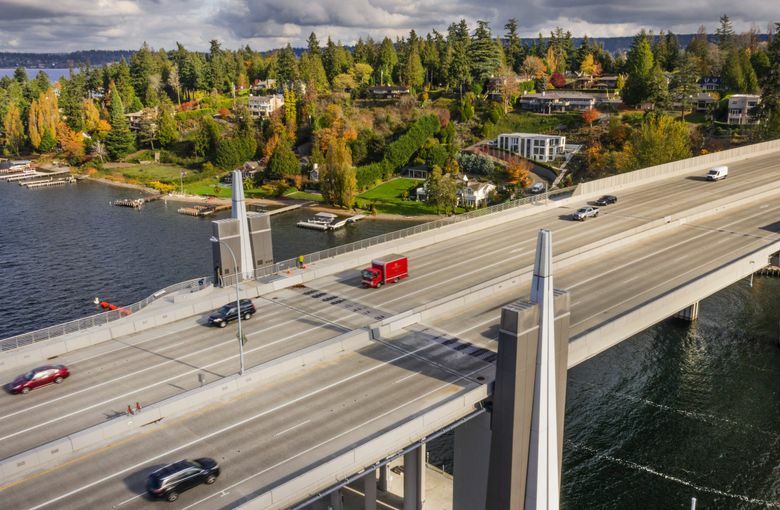 Washington state possesses four of the world’s five longest floating bridges and 78 years of operating history. Despite that experience, the state couldn’t prevent a loud ka-thunk noise thousands of times every day, at the new Highway 520 bridge. Cars produce a mighty din while crossing the broad expansion joints, over the hinges where road decks on fixed columns meet the mobile transition spans. 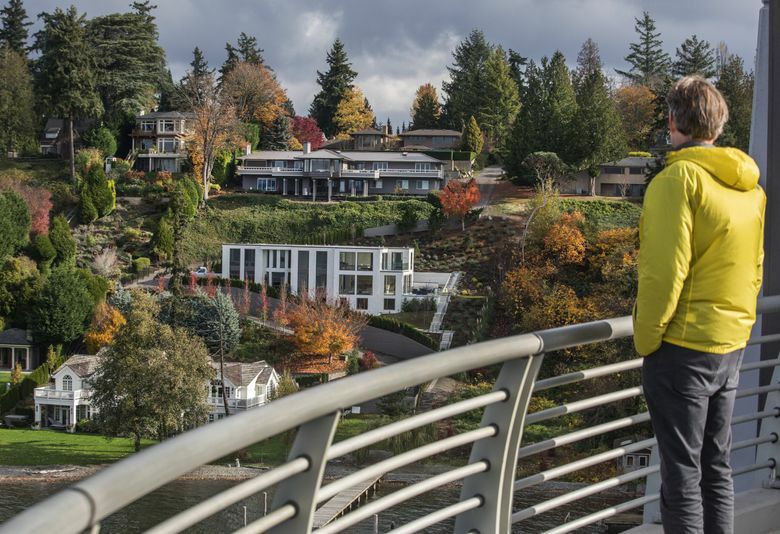 These spans swing up and down to match seasonal changes in the levels of Lake Washington. More than 200 neighbors have complained about the noise since bridge opened April 11, 2016. This fall, University of Washington scientists set up microphones in the bike lane and under the joints, in a quest for ways to quiet the bridge. “It’s a big deal for the neighborhood so I very much hope that we can make a difference for them,” said Per Reinhall, UW professor of mechanical engineering. The team will discuss findings with Medina city leaders Dec. 13. The Washington State Department of Transportation (WSDOT) intends to send a report to lawmakers by early January when the legislative session begins, agency spokeswoman Kris Reitmann said. The study was prompted by complaints from Medina, but is meant to provide noise-reduction ideas for more than 50 bridges, she said. Medina Councilmember Sheree Wen said she hopes WSDOT will make project requests before a Dec. 12 deadline to qualify in the 2019 state budget cycle. “Otherwise, we have to wait and suffer another two years,” Wen said. The Legislature earlier this year approved $181,000 for UW to conduct the noise study, with a report due Oct. 15. Sen. Patty Kuderer, D-Bellevue, said she’s not worried about the timing, since lawmakers often amend or update transportation budgets. But finding the money for any retrofits in 2019 will take effort, she said. When they designed the new Highway 520, engineers applied lessons from the Narrows bridge, by striving to confine the sound. A steel-and-concrete chamber under the new joints has contained noise so it doesn’t afflict lakefront homes about 70 feet below the bridge’s east high rise. But a different problem surfaced. Sound waves travel up and out. But the preliminary findings Nov. 7 and 8 showed otherwise, said lead scientist Alex Soloway. The noise “does not originate in the cavity below the expansion joint but instead comes from the top of the joint,” he said Thursday by email. Because the new bridge is taller than the former 1963 bridge, this noise travels a full mile before it dissipates into the trees on Clyde Hill. Wen, who is an acoustic scientist, says she recorded sounds at Evergreen Point Way beyond 90 decibels, the same noise level as a lawn mower in your yard. Neighbors have also complained on the Seattle side at Laurelhurst and Madison Park. The 2016 crossing contains grooved concrete that’s quieter than the asphalt used in the former bridge. That makes the banging of expansion joints more noticeable, at two to four times the sound of ordinary traffic, said Reinhall. Vehicle speeds vary depending on congestion, so the force of tires on joints is greater during off-peak hours than during congested commute times, Reinhall said. People hear some of the worst barrages while trying to relax after dinner. 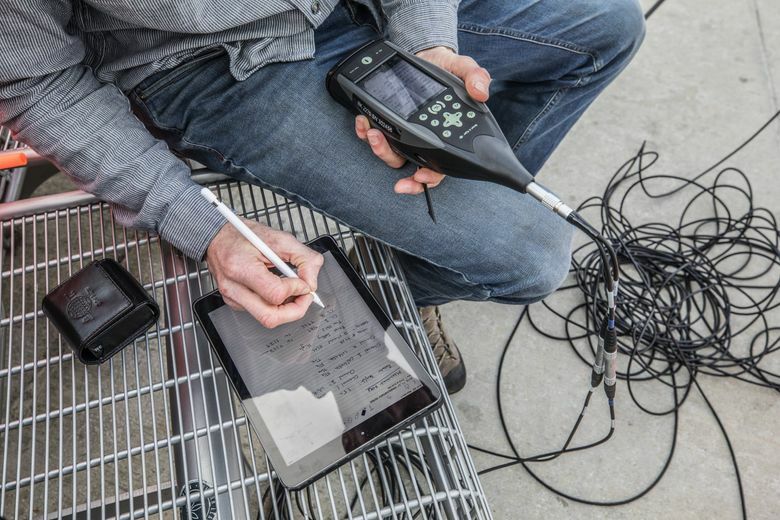 Scientists are examining the gaps between the 12 steel bars across the highway at each joint. Do tires strike the bars and gaps at frequencies that magnify impact sounds, or that compress air loudly? Can the sound patterns be altered? On a cold November morning, Reinhall and Soloway placed microphones on tripods in the bike lane to capture the noise. Each vehicle produces its own signature: Wide tires on Metro buses generate an easygoing bass, while sedans cause a high-pitched buzz. Soloway recorded concurrent GoPro video footage, so he could correlate sound spikes to a specific kind of vehicle. 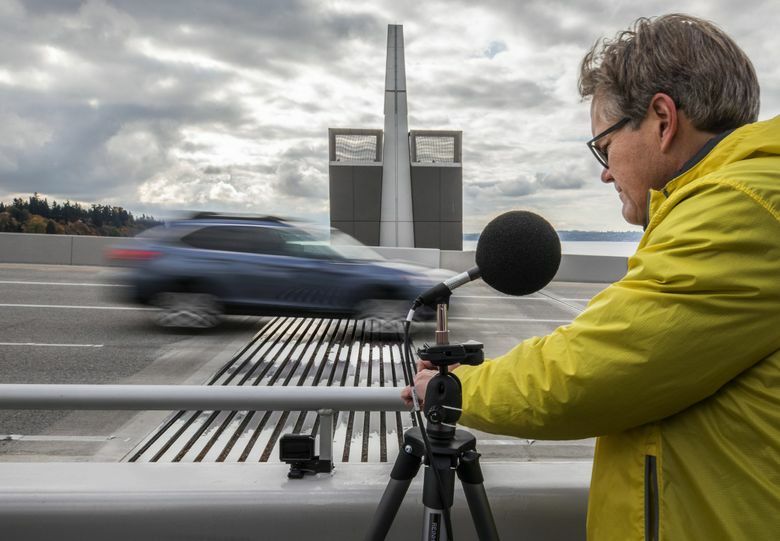 WSDOT’s criteria for evaluating sound follow the U.S. government’s 67-decibel limit, and an environmental-impact statement predicted the highway’s ordinary 4-foot-high road barriers, plus higher walls onshore, would control noise. The state says the new bridge joints are quieter than the old bridge, and by the time the sounds reach Medina homes they average 61 decibels or less — so they comply with federal standards, according to Reitmann. However, numbers like those are based on a 15-minute average, instead of the louder, irritating peaks when each vehicle hits the joints. The UW team finds “peak pressures” near homes to be 75 to 80 decibels during the one-quarter of a second that cars pass the joints, Soloway said. When Sound Transit light rail opened in 2009, the agency insisted its trains were meeting noise standards, based on averages, even though Tukwila neighbors next to the agency’s Duwamish River Bridge needed to shout to converse. After a resident took front-yard readings of 80 decibels, and critical news stories appeared, the agency admitted the sound was too loud, and spent $6 million on plastic barriers and track lubrication to reduce train noise. Costs to calm Highway 520 aren’t clear, nor are solutions. Researchers earlier thought Tacoma-style noise walls next to the joints might help, but the November data showed the sound would refract around them, Reinhall said. The team will consider how to make the joints themselves quieter. Rubber fill has been added to Interstate 90 and other bridges worldwide, but it tends to wear out often. Reinhall mentioned a new idea last week: add steel pieces to reshape those 12 straight bars per joint into wavy bars. That way, tires would strike the bars differentially, rather than hitting parallel bars that resonate. Whichever method is chosen, this round of studies and retrofits was meant to be preliminary, he said. Efforts to calm Highway 520 noise will continue.